EPP delegates, including several Fidesz party members, voted 190-3 in favour of the suspension. “If there wouldn’t have been a compromise, I would have left the EPP,” Orban told reporters in a press conference following the vote. Ahead of the vote, Commission President Jean-Claude Juncker, as well as 13 sister parties in the EPP, had called for Fidesz’s expulsion. Germany’s CDU party leader Annegret Kramp-Karrenbauer, however, had advocated for a compromise ahead of the meeting. According to the proposal of the EPP presidency to the political assembly, obtained by EURACTIV, “the suspension entails no attendance at any party meeting; no voting rights; no right to propose candidates for posts,” president Joseph Daul said in a tweet. Furthermore, the party “will no longer be present at any EPP meetings,” starting with Thursday’s summit. “Fidesz voluntarily proposed such consequences, membership will be suspended,” the text concludes. A source in the room told EURACTIV that the wording “the EPP Presidency and Fidesz jointly agree that Fidesz suspends its membership in the EPP until the report of the evaluation Committee is ready” was agreed after a mediation meeting which lasted the entire afternoon. According to the same source, Kramp-Karrenbauer had a decisive role in the mediation. As the document obtained by EURACTIV states, the evaluation would be made by a committee chaired by former European Council head Herman Van Rompuy, with former European Parliament president Hans-Gert Poettering and former Austrian Chancellor Wolfgang Schuessel. The so-called ‘three wise men’ are tasked with monitoring the implementation of three basic conditions proposed by EPP Spitzenkandidat for the May European Parliament elections, Manfred Weber. The conditions are the immediate removal of “posters and other advertising materials used to run a fake news campaign against President Jean-Claude Juncker”; recognition by Fidesz that this campaign has caused considerable political damage; and clarification of pending legal issues regarding the Central European University. However, Orban said, there was “never any campaign against Juncker. What we have in Hungary is an information campaign.” The comments were met with amusement in the press room. The Evaluation Committee will also assess the respect for the rule of law, and ‘EPP values’, as well as the implementation of the EPP emergency resolution on ‘Protecting EU Values and Safeguarding Democracy’, the proposal said. As the decision is meant to take effect immediately, this also means that Orbán will not take part in the traditions EPP pre-summit gathering of EU leaders on Thursday (21 March) before the European Council meeting. Earlier in the afternoon, Weber backed the suspension of Fidesz pending an inquiry into its actions, which he said would have “enormous political bearing”. After the vote, Weber said the group had taken a “clear decision” on Fidesz after a “frank, honest and hard discussion”. “The message was crystal-clear today and I am proud the EPP could make obvious to the outside world that Fidesz would not have any say over the future developments of the EPP,” said Weber. Orbán, meanwhile, described the outcome as a “good decision” and a compromise. “Fidesz wishes to remain a member of the EPP. Our opposition cannot have a better gift than a heated debate in the EPP,” the Hungarian PM argued. But he also accused “left wing liberal parties” within the EPP of calling for Fidesz’s expulsion. “This would have turned the EPP in a more narrow, left-leaning organisation,” he told reporters. “I would not change my policies, my political approach,” he stressed. “We remain committed to EU values but also we don’t want migration, we want to protect Christian values,” Orban said. Orbán concluded that staying in the EPP will “ensure unity of the conservative forces before the European elections,” adding that “we can organise a strong campaign and we can continue to support Mr Weber as Spitzenkandidat”. Last year, the European Parliament endorsed a report by Judith Sargentini, a Dutch Green MEP, which accused Orbán’s government of posing a “systematic threat” to the EU’s fundamental principles. In September the parliament launched the so-called Article 7 procedure against Hungary over a “clear risk of a serious breach” of EU rule of law. “If I were them, I would not want to be hijacked by this and then let us just see if all those far-right parties manage to find a common ground to have an effective group,” she added. Critics, however, were quick to say that the suspension came too late and that the damage to the party’s integrity is already done. “The decision to temporarily suspend the terms of Fidesz’s membership of the EPP Party is a political trick that shames Europe,” Guy Verhofstadt MEP, President of the ALDE Group, commented afterwards. “For too long, the supposedly pro-European EPP have provided a safe harbour for Viktor Orbán, while he undermines the rule of law in Hungary and relentlessly attacks liberal democratic values,” Verhofstadt added. 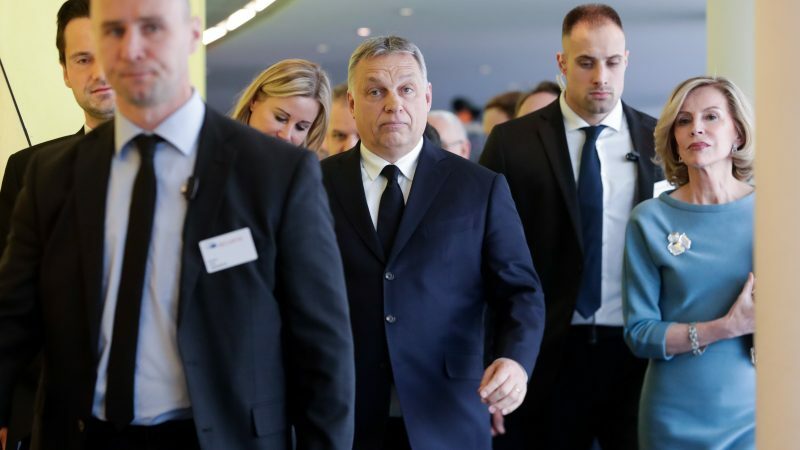 “The fact that EPP only reacted after Orban attacked the European Commission President from his very own party does not undo the damage that has been caused already,” Udo Bullmann, leader of the Socialist and Democrat group, tweeted. Earlier on Wednesday (20 March), Juncker, himself an EPP grandee, repeated his call for Fidesz to be kicked out of the grouping. “I think that Mr Orban is a long way from basic Christian Democratic values,” he told German radio. The controversial poster campaign has depicted Juncker as a proponent of mass immigration into Europe and a puppet manipulated by Hungarian-American billionaire philanthropist George Soros, who also founded the private Central European University in Budapest. Sources close to Weber said Orban had at least partially met the German conservative’s conditions for keeping Fidesz in the EPP, including by apologising to colleagues in the grouping for labelling them “useful idiots”. The EPP almost did the right thing, but hey, they’re politicians and politics is a prostitute.